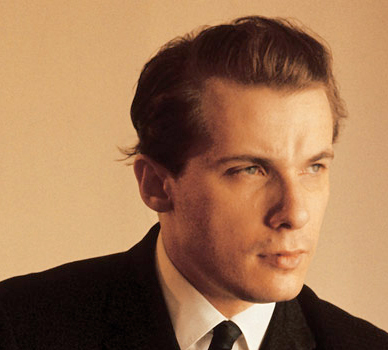 Here we are going to introduce you to one of the great talents of the past, the Canadian-born pianist Glenn Gould. However in this initital foray into his world, we're not going to hear him play. First here's a bit of background. Glenn Gould was born in Toronto on 25 September 1932 into a musical family: Edvard Grieg was a first cousin of his mother's grandfather, his father was an amateur violinist, and his mother played piano and organ. Gould's mother was his only teacher until he was ten. When he was three years old, it became evident that he possessed exceptional musical aptitude, including absolute pitch and even the ability to read staff notation. At five, he began to compose, and played his own little compositions for family and friends. At the age of six Gould was taken to his first live musical performance which was Josef Hofmann's last appearance in Toronto. It created a lasting and important impression upon the boy. Gould's first public performance was in 1945 on the organ, a concert which was reviewed under the headline "Boy, age 12, Shows Genius As Organist." On the evening of 11 January 1955, Gould made his debut in New York ("Debutown" as he called it) and the next day signed a recording contract with Columbia Masterworks (CBS). 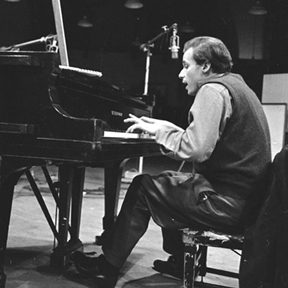 Gould's first recording of Bach's Goldberg Variations took place at the CBS studios in June 1955. The record won instant acclaim, became a best seller, and launched Gould's career as a fully mature international artist. Gould was extraordinarily adept at playing contrapuntal music, especially the fugues of Johann Sebastian Bach. When you hear him play, it is as though four separate minds are playing, articulating each voice individually. He was very interested in radio broadcasting, and we're going to bring you an excerpt of one of his radio documentaries, titled "The Idea of North." In this hour-long broadcast from which we shall listen to 3 or 4 minutes, a group of people who were not in the studio together talk about the idea of living above 60 degrees latitude, where not many folks live. Gould edited these people's commentary together as though he were Bach, creating a great fugue. The result is captivating, even in those sections where more than one person is speaking at a time. To see Gould in action, visit youtube.com, do a search for Glenn Gould and click on the first excerpt from The Art of Piano Documentary. This bit of history has gotten hundreds of thousands of hits and when you see it, you'll know why. To hear a portion of The Idea of North, click here.